Most restaurants don’t sell a lot of dessert wines, but at John Howie Steak, we know how dessert wines are the perfect way to finish off a meal. Dessert wines are sweet but often they tend to be lower in alcohol, and you’ll enjoy drinking it in a small amount. Like a kiss at the end of the dinner, as you say goodnight to your friends. 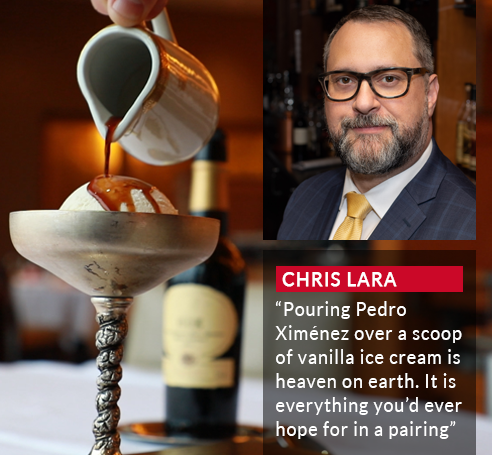 One of the first wines Daniel put on the dessert wine list, was the Pedro Ximénez Sherry, paired with a scoop of vanilla ice cream. Pedro Ximénez is one of the three grapes typically used in sherry production. The Pedro Ximénez grapes are dried, and then pressed and fermented with a little alcohol for fortification. The result is a dense, syrupy sherry that is very bold on the palate with a rush of flavor. Our list also includes some amazing flights.One of these flights is called Pourriture Noble. 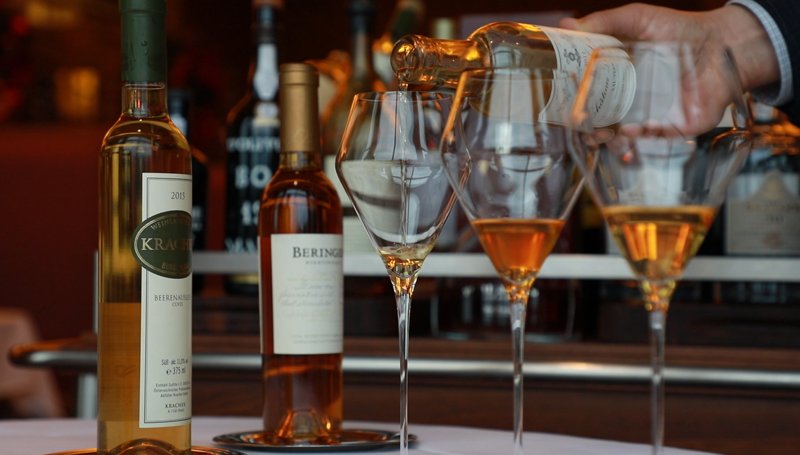 All three dessert wines carry the hallmark of botrytis or `noble rot’ – which is a fungus that affects the skin of the grapes, allowing them to dehydrate on the vine. There are different ways of picking grapes with noble rot — sometimes they are picked in bunches with grapes that are not affected, and other times only the noble rot affected ones are selected. But the process in every case is exacting, expensive and time consuming. If desired we are offering 1998 Chateau d’Yquem as a supplement to Chateau Laribotte. Yquem is considered the best Sauternes around, a true delight. The second flight of dessert wines offered is themed around Tawny port. These wines from Portugal have been aged in wood, which imparts a complement of unique nutty undertones, like walnut, hazelnut, as well as a hint of maple syrup and smoked bacon. This flight presents Graham’s “Tour of the Decades”, featuring 20 year, 30 year and 40 year Graham’s Tawny ports. For those looking for the ultimate experience, we offer the 1967 Colheita Port, which is a true, 51-year-old vintage Tawny port. “While the 20 year, 30 year or 40 year port are indeed wonderful, it is still fun to try a `true’ vintage port like the 1967 Colheita,” says Lara. Crowning this selection of dessert wine choices, John Howie Steak has dared to go where few fine-dining establishments dare to tread: they’re presenting the Tokaji Essencia from Royal Tokaji – an exceptionally rare dessert wine that for centuries was reserved for and enjoyed by Kings and Czars. At John Howie Steak, it is presented the traditional way in delicate crystal spoons. “The rarity of the Tokaji Essencia comes from the painstaking ritual that goes into the production,” says Lara. “Once the `noble rot’ has set into these grapes, they are handpicked – individual berry by berry – several times a day until a small, prize amount is collected in a bucket. Thereafter, the grapes are allowed to rest on their own weight with no artificial pressure, and as gravity pulls them down, a small precious amount of juice ekes out, which in a way is the `essence’. It is the truest expression of terroir known to man. There is so much sugar in this juice that it can take 10 years or longer for it to ferment to even a 4 % or 5 % of alcohol by volume. To have a taste of this is so pure and so thick that even just a smallest amount will stay with you for the rest of your life. Presented in beautiful, little crystal spoons that hold one quarter of an ounce, and that’s all you need to appreciate the wonder of the Tokaji Essencia. “I consider the Tokaji Essencia to be a bucket list item. Very few restaurants offer this unique experience, because they don’t want to commit to the proper way of presenting this legendary Hungarian wine,” says Lara. Indeed, it is rare to experience something so incredible that you talk about it for years to come with friends and family. And remember that first tasting as the highest wine experience of your life. Then come, join us for dinner one of these days, and allow Chris Lara to immerse you in the heady world of the finest dessert wines. Call us at (425) 440-0880 for reservations or visit our website for more information.